This Electric Sheet Metal Shear features a 1/2 HP, 110V, 2500 RPM, 3.8 amp motor, a 360 degree adjustable swivel head, and variable speeds from 0 to 2500 SPM. Cuts up to 14 gauge in mild steel and 18 gauge in stainless, at up to 150 inches per minute. Weighs 5 lbs. still in building stages on garage. 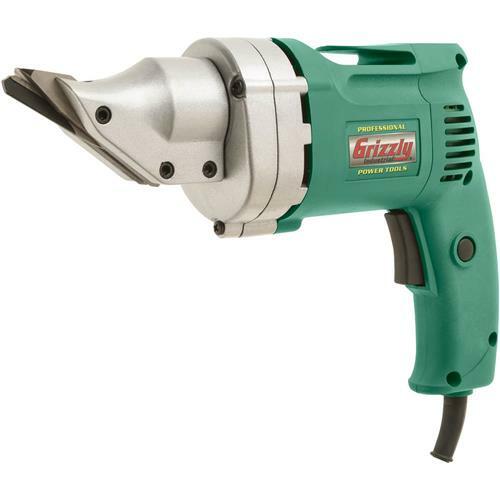 I haven't used it yet but Grizzly always makes great tools. I bought these shears to cut pro panel to construct a barn. They have worked great, much better than a skill saw. I bought this one when it was on sale for a little more than what a new set of blades was going to cost for my older and smaller metal shear. The variable speed makes it much easier to use. My old one didn't have that. Well worth the fifty some odd dollars I paid for it! Works great. Bought it to cut FRP panels. And low And behold it has been cutting them like paper.